So, this requires a little explaining. On the advice of my friend Tosca Lee, who was Mrs. Nebraska, I read the book Fast Track One-Day Detox Diet by Ann Louise Gittleman . I did not do the one-day detox, but I was fascinated by her explanation of liver function (yes, my geeky biologist side is coming out) and the foods that help the liver out. Apparently in order to break down toxins, the liver uses a two-step process (which I vaguely remembered from my college biology classes). The first step sometimes creates a compound even more toxic than the original, but that’s so that the liver can then go to the second step and break down the compound entirely into a form that can be eliminated from the body. It’s a common thing that I remembered from organic chemistry. Sometimes you need to make a more complex-looking compound in order to use a certain catalyst and break the compound down into what endpoint you want. Anyway, the body needs certain things for both steps of the process, but if you’re lacking in things for the second step, you’re stuck with a toxic compound in your body that your liver can’t break down. That’s why you get headaches and stuff when you’re in detox. For the detox diet, the author recommends eating certain foods the days before the detox so that your liver isn’t lacking in anything. Which makes logical sense. I didn’t do the detox, but I try to eat the foods that she recommends so that I have a happy liver. Some things are harder to eat than others. Like beets. There are other things in the list that I can eat besides beets, but since we’ve been getting lots of beets in our organic co-op basket each week, I figure I should eat them rather than going out to buy some of the other veggies in the same list just so I can avoid eating beets. But then I was looking at a raw foods website and saw a recipe for a green smoothie that didn’t seem too bad. The woman added a lot of fruit to her smoothie as opposed to having it be all green. And since Captain Caffeine bought his nifty super-duper Blendtec blender, I figured I’d try a green smoothie in order to get my beets and other veggies. I put in a chopped raw beet, a chopped raw carrot, 6-8 stalks of chopped Swiss Chard with the stems cut off, about 1.5 cups of frozen strawberries, and an overflowing tablespoon of honey. I also added a bit of water. Can I just say, the Blendtec blender is totally awesome!!!!!! The consistency is very smooth and the blender is incredibly easy to clean, as opposed to my old KitchenAid blender (that thing was at least 15 years old). And the smoothie tastes okay. There’s a slight “green” smell of the raw beets/chard that I’m not nuts about, but the flavor is good, nicely sweetened by the honey and strawberries. I have to admit it looks a bit repulsively mold-green, but it tastes fine as long as I don’t stare at it. 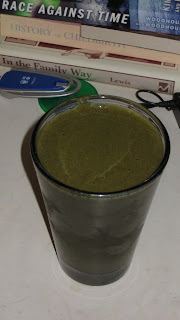 Another benefit is that it’s a great smoothie for me to drink in the morning when my stomach is usually a bit nauseated. The smoothie is no-fat and easy on my stomach, and it has greens in it, and they say that you should try to eat veggies with breakfast somehow anyway for a well-rounded meal. We’ll see how this goes. Any thoughts? LOL I'm not doing this every morning, just whenever I feel like it. I have always woken up feeling nauseated--my family has a tendency toward acidic stomachs, esp in the morning. My dad takes Zantac but I don't want to have to take medication if I don't have to. Oh this made my day! Am laughing so hard right now! That would be the main drawback for me...too much work and way too lazy! I'm just not sure about this whole detox thing anyway. I have a friend who does some type of detox every month then I read on Sparky that they don't really do anything. So I just bumble through (am I even making any sense?) and try to take care of myself the best I can. I'd gotten so close to my goal then started moving back up again. GOTTA get back down! I think a detox once in a while if you're feeling kind of run-down is a good thing, since we have so many toxins in our world, but a detox every month seems a bit extreme, don't you think??? I'm always run down but don't think it has to do much with toxins....a certain amount of time in bed would probably help more. But then I do have bouts of insomnia which doesn't help, either. And yes, I think what my friend is doing is very extreme. Whatever works for her! I think I'll pass! Oh yeah, sounds like you need more sleep! But the insomnia could be some toxins keeping you up, too. Peachy. So you're trying to talk me into doing a detox? I wouldn't even know where to start! I did have a former friend call me toxic before. How do you know if you're toxic or not? That wasn't very nice of your friend!!!! The sad thing is I'll never know what I did wrong...think I might try checking out that book.